Portrait of Horatio Hocken, October 27, 1925. City of Toronto Archives, Fonds 1266, Item 6480. 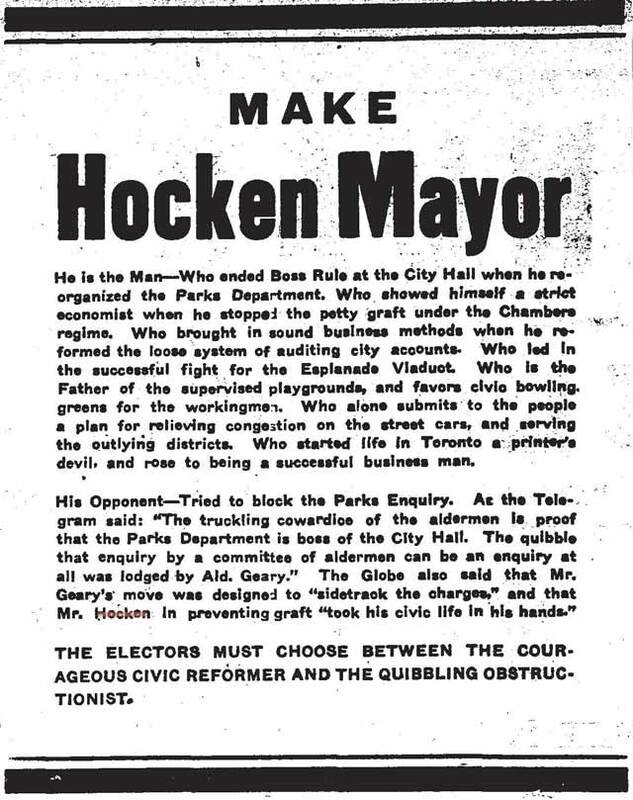 During a campaign speech to the Deer Park Ratepayers’ Association in December 1912, Horatio Hocken defined one of his primary political goals: meeting the city’s long-term needs. We want big men with big ideas, men who can see that in a few years Toronto is going to grow into a city of 750,000, and soon after that into a city with a million. It is the future we must provide for, not the present. For if we go on providing for the present as we have done so often, our public works will be outgrown before they are finished. You have had plenty of examples of that already. 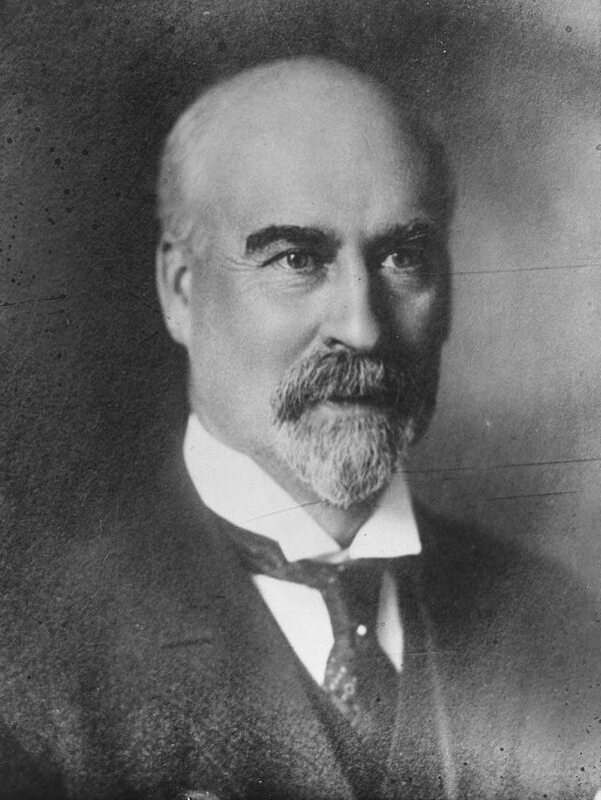 During his terms as a member of council’s Board of Control (1907-09, 1911-12) and as mayor (1912-14), Hocken crusaded for stronger municipal infrastructure—including improved sewage and water systems, health services, and housing—and argued on behalf of public ownership of transit and utilities. His opponents believed his proposals were too expensive. 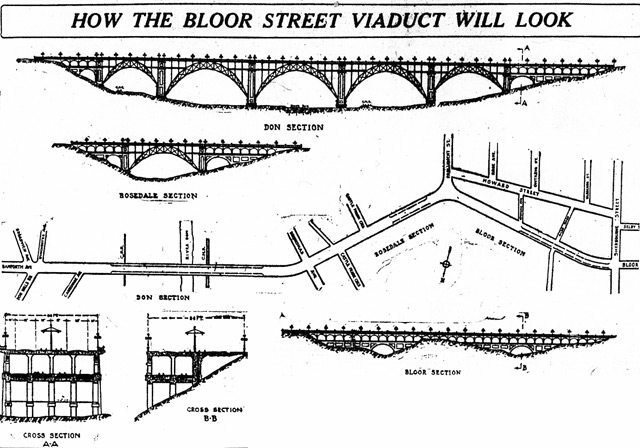 He did win some battles, one of which resulted in the construction of the Prince Edward Viaduct, but some other dreams, like a proto-subway system, would not achieve broad political and public support for decades. Advertisement, the Toronto Star, December 31, 1909. Born in Toronto in 1857, Hocken developed an early love of books and politics thanks to his shoemaker father. At 16, he became a compositor for the Globe, where he developed a reputation as the fastest typesetter in the city, earning the nickname “Race.” Hocken then moved to the News, where he served as composing room foreman. Along with 20 other printers, he went on strike in 1892 to protest the paper’s plan to install typesetting equipment and switch compositor pay from a salaried to piecework basis. The strikers then launched their own newspaper, the Evening Star, and named Hocken as its business manager. Within a year, Hocken was lured back to the News by the offer of a reporting job. His successes on the City Hall beat—which included an exposé on municipal water contamination—led to his appointment as editor-in-chief in 1895. Apart from a short stint running a paper in St. Thomas, Hocken remained at the News until 1905, when he purchased the Orange Sentinel from the estate of former mayor Edward Clarke. A loyal Orangeman and staunch Methodist, his calls for a single school system (“One school, one flag, a united Canada”) did not go down well with the province’s Catholics. When Hocken first ran for elected office in late 1906, he took an unusual route. Neophyte politicians usually entered city hall via the board of education or by running for alderman. Drawing on his extensive experience covering government, Hocken decided to run for the Board of Control, a four-member branch of council that could be compared to today’s executive committee, and whose members were voted in on a city-wide basis. 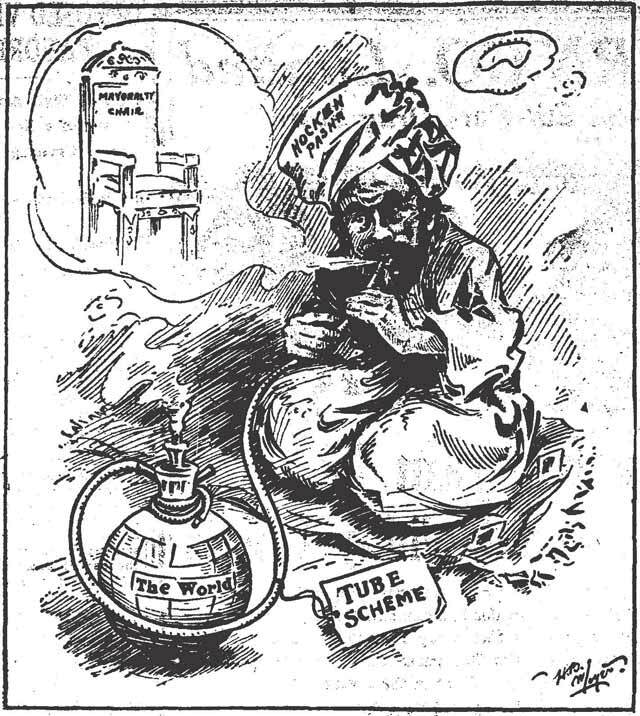 “The pipe dream of Hocken Pasha.” Cartoon, the Toronto Star, December 22, 1909. The subway scheme, dubbed the “Hocken Tubes” by the press, was a key component of Hocken’s first mayoral run. Though voters approved the tubes on a separate referendum question, Hocken was defeated by just over 4,000 votes on January 2, 1910, by tax-cutter George Reginald Geary. The same voters rejected another ballot question on a modified subway plan two years later, and the issue wouldn’t gain new traction until the 1940s. Cartoon, the News, October 22, 1912. After his defeat, Hocken joked that “a year in private life will be good for me and my business, but I’ll be mayor yet”—and he was right. On October 21, 1912, Mayor Geary resigned to accept an appointment as the City’s chief legal counsel. Three councillors were nominated to replace Geary: alderman John Dunn, controller Tommy Church, and Hocken, who had returned to the Board of Control in 1911. Church, an ambitious man who never met a hand he didn’t shake, demanded that council unanimously support him, as he had served as acting mayor for Geary on several occasions. Alderman Sam McBride urged Hocken to withdraw, knowing of his intentions to run for mayor in 1913. 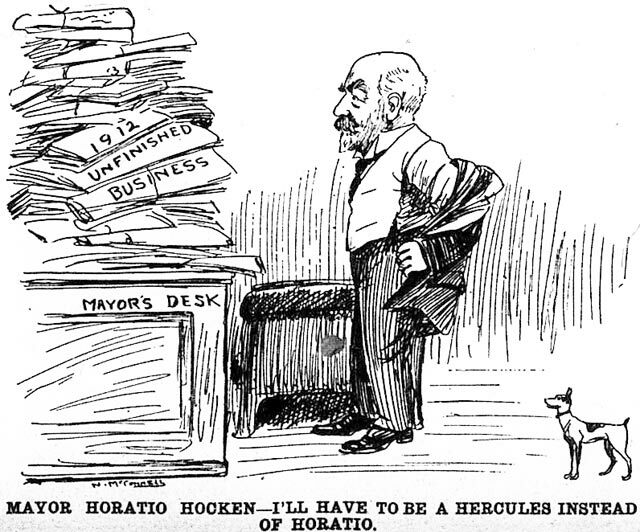 Alderman John Wanless defended Hocken, citing his integrity and willingness to tackle the City’s problems. It didn’t hurt that Hocken had earned the most votes among controller candidates during the previous election. Church and Dunn withdrew their nominations, leaving Hocken with a unanimous vote. Illustration, the Toronto World, December 29, 1912. 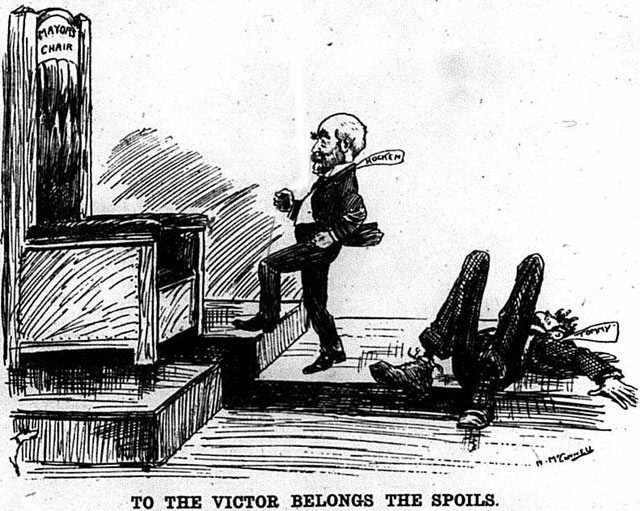 Over two full terms, Hocken’s social reform impulses came to the fore. He championed public health improvements such as milk inspections and water testing. Toronto’s death rate from communicable diseases fell from 114 per 100,000 in 1910 to 27 by 1914. To combat a “meat trust” and keep independent butchers in business, the Toronto Municipal Abattoir was established. The Toronto Housing Company was created to offer alternatives to slum apartments and tenements (its projects later evolved into the Spruce Court and Bain Co-ops). Parkland was created. An industrial farm near Richmond Hill was established to reform minor offenders. Hocken also supported a bylaw devised by controller James Simpson, which created a $15/week minimum wage for municipal employees. Cartoon, the News, October 23, 1912. Hocken didn’t remain out of politics for long. He served as a Conservative MP for Toronto West (later Toronto West Centre) from 1917 to 1930, and as a senator from 1933 until his death in 1937. Additional material from The National Encyclopedia of Canadian Biography (Toronto: Dominion Publishing, 1935); Saving the Canadian City: the first phase 1880-1920, Paul Rutherford, editor (Toronto: University of Toronto Press, 1974); the January 2, 1914 edition of the Globe; the October 22, 1912 and January 2, 1913 editions of the News; the October 21, 1912, December 28, 1912, June 30, 1961, November 10, 1980, and December 19, 1987 editions of the Star; and the January 2, 1913 edition of the Telegram.